Striped Wallpapers are absolute classics; their enduring popularity is due to the fact that they can create an optical illusion which will make a room appear smaller or bigger, give it more depth, and focus the attention. A stripey wall cover is a true all-rounder - block stripes, vertical or horizontal stripes create elegant, fresh, trendy and captivating interiors. Our wallpapers prove that a tiger can change its stripes and come in unusual, powerful, stark, and subtle designs in many surprising colours and materials. Wallpaper with stripes catches the eye and its occasionally psychedelic effects give any room fascinating 3-D depth. Our new collection comprises both bright and muted colours in simple combinations - or a wild mix. Striped wallpapers can be used to achieve individual style or determine the general feel of a space. Mediterranean flair or majestic magnificence, a bit of romance or clear geometric elements – our striped wall covers provide dynamic movement and expressiveness. Used in children’s rooms, they stimulate any kid’s imagination and spatial sense. Magic moments, space odyssey, the immenseness of infinity - Striped Wallpaper enables you to discover new horizons. It allows for the realisation of individual, innovative interior design ideas. Their multi-purpose character can have both a calming as well as an invigorating effect on body and soul. 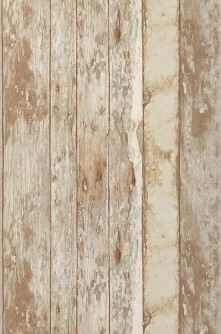 Just try it for yourself and rediscover this classic wall design afresh. Our online shop features a large array of choices – you are bound to find just the right design for your requirements. In terms of patterned wallpapers,striped wallpapers are simply universal talents. Stripe patterns are suitable for a large array of interior design concepts. The can complement single colours and optically change the layout and appearance of a room. Not all stripe designs are the same, as you will soon discover if you check out the large range of Design Striped Wallpaper in our Wallpaper Shop. There are horizontal, vertical, diagonal stripes, thin stripes as well as wide block stripes, and of course stripey designs composed of figurative elements, all of which open completely new perspectives and dynamic in a room. Wallpaper with stripes is a true optical magician: depending on the size of the stripes and the way the wallpaper is applied, it can visually change the layout of a room. Colours and materials are used to achieve the desired ambience and mood. We will tell you everything there is to know about stripey wall décor in order to make your choice easier. In addition, stripes can be arranged in an offset way; choosing different colours will provide optical differentiation. Striped wallpapers with a combination of horizontal and vertical stripes create a specific optical illusion. This effect can be reminiscent of a braid pattern and is created by using colour combinations, graphic elements and plastic [PÉ1] materials. However, most stripe patterns are vertical. 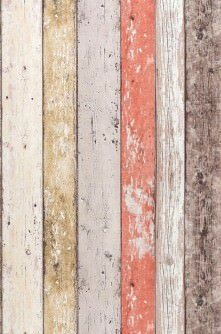 Design examples for interesting stripey wall décor can be found in our Wallpaper Shop, for instance Fenegra, Rattan Chalked, Tallec or Milella. These striped models determine the look and feel of a room and should be used sparingly. 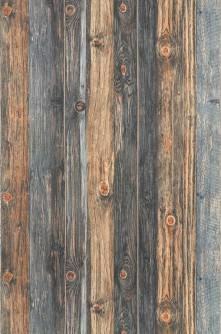 They are highly suitable for feature walls, e.g. behind the bed in the bedroom. 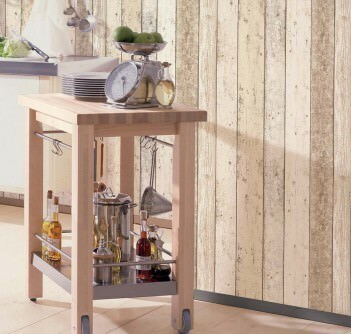 This type of wallpaper with stripes is also ideally suited to define the dining area in a kitchen. Stripes can be arranged dead straight or in a slightly more curvy, seemingly "hand-painted" movement. Batik effects and colour gradients soften the otherwise often stark appearance of stripes and give them a multi-dimensional feel. Irregular seguing between stripes is another way to make striped wallpaper look less severe. Stripey patterns don't just come in wide or narrow form. Figurative, geometric, floral, abstract elements can be arranged vertically or horizontally to create stripes. Combined with strong or subtle colours, these stripe wallpapers can be used to complement a large variety of interior design styles. 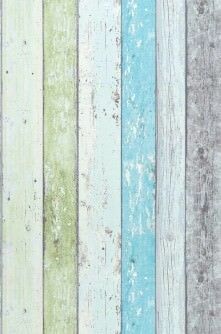 Stripes have always inspired wallpaper designers to shape new ideas and concepts. They combine wide stripes with narrow stripes, integrate other elements or ornaments to attract the gaze. Delicate roses entwined around block stripes, lending a romantic touch to the clean, sober stripes. Stripey wallpapers are not tied to one particular surface material, which is one of the reasons for their incredible versatility. 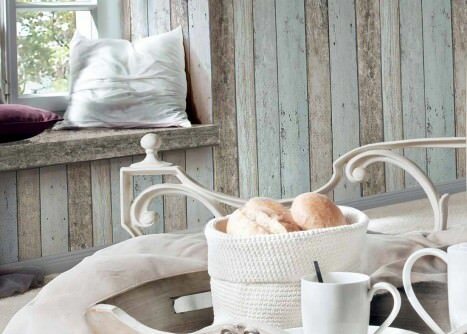 Natural and textile surfaces like grass, linen, bast and bamboo provide a stripey texture by their very nature and are therefore particularly suited for the romantic country cottage style, very natural or "green" environments and the exceedingly popular Asia look. 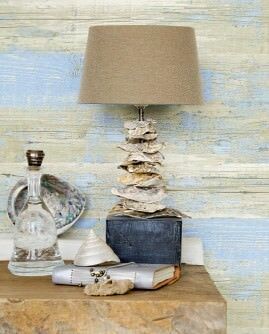 Using natural colours in stripey wallpapers emphasise this effect. 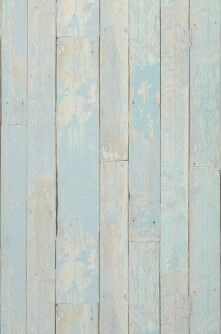 Weathered wooden plank-look stripes which show the signs of time and some patina are always on trend and work as decorative elements in the cool Industrial style just as well as for the Country look or Shabby Chic. 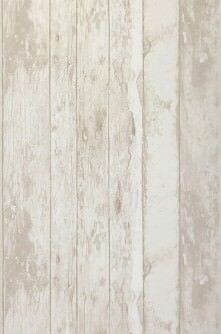 For those who love stripe structures with a natural, playful flair, Crush wallpapers are the obvious choice. The unique, irregular folds are reminiscent of the branches and twigs of a tree, and individual colouring, glossy or matt effects create very stylish and elegant wall treatments. Glass bead wallpapers create a glamorous and dazzling effect and give walls a touch of luxury. Effect foil and metallic wallpapers are futuristic and modern with a playful note. The thin foil creates a pattern of light and colours with iridescent characteristics which take the humble stripe to another dimension. These projection areas for the eye provide a magic effect. Last, but by no means least, we should mention our stunning leather-effect wallpapers. Their surface is refined with imitation leather and the structure can have a subtle stripe pattern. Striking block stripes, paper-thin subtle stripes, narrow and wide stripes combined to create a dynamic picture - striped wallpapers fulfil even your wildest interior decoration desires. The width of stripes is not unimportant when it comes to designing a space. Block stripes make a room appear smaller, and the arrangement of the stripes (vertical, horizontal) plays an important role for the layout of a room, too. Straight lines are one of the characteristics of stripey wall décor, providing a dynamic order. Irregular stripes, on the other hand, can be a real eye-catcher. Stripe patterns allow for a sheer endless number of colour combinations and colour techniques. For instance, individual stripes can come in different colours. Alternating colourful stripes in contrasting hues are perfectly suited for a lively environment - but don't forget: less is more. Tone on tone gradations have a calming and sophisticated effect. Mixing glossy and matt colours creates a high-low structure. Tip: You can use colours to create specific moods. Prepare by contemplating how the room will predominately be used and what kind of ambience you are hoping to achieve. Warm hues like red, orange, yellow are stimulating, fill a room with energy, increase activity and enhance the appetite. Combining white and black gives a room a sophisticated, extravagant feel. Blues and greens are most suited to rooms that require a sense of relaxation, concentration and attention. Purple is a creative and spiritual colour, very dominant and mysterious. When it comes to the colour combination of your striped wallpaper and its effect on the rest of the interior design concept, remember that strong contrasts can be disharmonious. 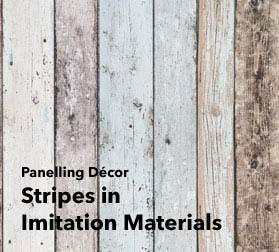 Furniture and accessories should complement the specific material limitations of your stripe wall treatment. 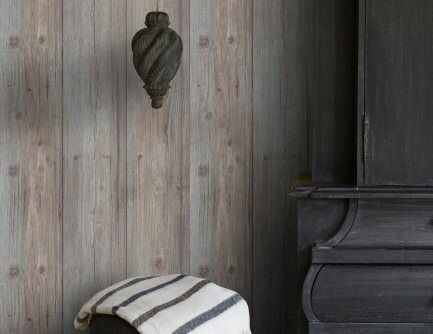 Stripey wallpaper in a weathered wood look will benefit in terms of structure from antique furniture and decorative elements with wooden branches and twigs or even tree trunks. Cotton fabrics in complementing colours to a glossy striped wallpaper provide an effective contrast. Visit our Wallpaper Shop to find high-quality wallpapers with stripe patterns in a variety of surface materials. The carrier layers are usually paper-based or non-woven (fleece). The carrier material is the bottom layer, i.e. the one touching the wall. When it comes to hanging the wallpaper (and removing it later), the carrier material has a major impact. 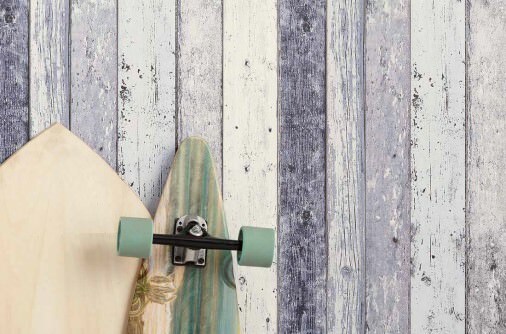 Recycled paper is frequently used as carrier material for paper-based wallpaper with stripes, whilst the surface material can consist of any number of materials. The adhesive or wallpaper paste is applied to the back of the wallpaper. Paper-based wallpapers require a specific soaking time, and each strip needs to be soaked for the exact same amount of time. Depending on the specific make, paper-based varieties can be removed from the wall in a dry state or after soaking. 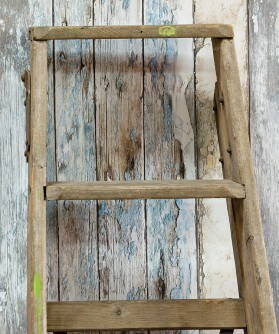 For those stripey wallpapers made from paper, the carrier layer remains on the wall, and the top (i.e. the decorative) layer is pulled off. The carrier layer of non-woven wallpaper with stripes consists of cellulose and textile fibres. In terms of the surface material, there is a variety of different options. Striped wallpapers (non-woven) are extremely robust and dense and can conceal minor irregularities in the surface of the wall. They are well suited for wet rooms and can be removed in a dry state. Another advantage: The adhesive or wallpaper paste is applied directly to the wall, which means that the wallpaper does not have to be soaked. Low ceilings: Choose wallpapers with vertical stripes. High ceilings: Choose wallpapers with horizontal stripes, possibly combined with a plain-coloured plinth area as well as a connecting border. Small room: Choose wallpapers with narrow vertical lines. Wallpapers combining wider and more delicate stripes are also an option. Light, natural or pastel colours, gloss or metallic effects or tone-on-tone gradations also make a room look bigger. If you prefer brightly coloured striped wallpapers in striking shades, you should stick to narrow lines and choose just one feature walls - the other walls should be kept in just one fitting colour. Large room: Vertical and horizontal stripe designs are both options. If you go for vertical stripes, the colours can be bright and intense; darker shades are also possible. Stripes with colour gradients and batik styles can really lift a big room. Please remember to consider the amount and intensity of daylight in the room (direct sunlight). For very bright rooms, select light-resistant wall treatments so the colours remain bright and beautiful for as long as possible. If the room doesn't have a lot of direct sunlight, avoid stripey wallpapers that are too dark. The type of room, and thus the potential strains to the wallpaper with stripes should determine your choice of striped wall décor. For instance, you should choose moisture-resistant and washable varieties for wet rooms and other highly frequented areas like bathroom, kitchen, dining room, children's room, hallway and stairways. Wallpapers in stairways, kids' rooms, kitchens and dining rooms are much more likely to be damaged as these are the busiest areas of the house. Choose a stripe wallpaper with stronger grammage (i.e. thicker materials) and resilience. 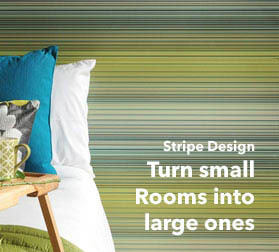 Stripe wall treatments with delicate surfaces, e.g. textile wallpapers, glass bead wallpapers, effect foil wallpapers, metallic wallpapers or natural wallpapers should not be used in very busy areas. Vinyl wallpapers or PVC varieties usually have a carrier layer made from paper or a non-woven material. 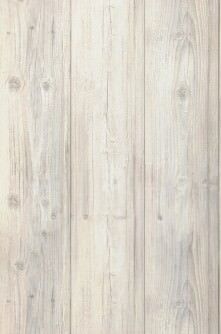 These washable/wipeable wall treatments with stripes come in a huge variety of different styles. 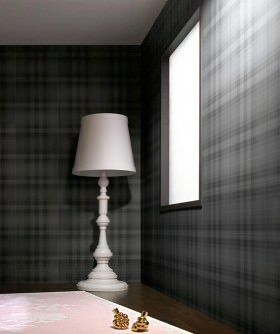 For very busy rooms, vinyl wallpapers are a very good choice. Brightly coloured vinyl stripe wallpapers will lend new life to any room in the house and are available in our shop to order. For bathrooms, we recommend non-woven stripe wallpaper with vinyl coating as they can deal with moisture exceedingly well. The carrier material is very stable, it doesn't shrink or expand.